Win Two Tickets To The Los Angeles Premiere Of THE HUNGER GAMES: CATCHING FIRE! Are you ready for the Quarter Quell? Lionsgate is, and they're teaming with seventy-five websites to give away tickets to the Los Angeles premiere of THE HUNGER GAMES: CATCHING FIRE, which will be held on November 18, 2013. 1) Send one (1) email to mrbeaks@gmail.com with the subject "TickTock11". 2) Include only these two things in the body of your email: your full name and the full name of your guest (if that name happens to change between now and the premiere, it's not a problem; I just want to have two names to give to Lionsgate). Please do not attach any fan art, fan fiction or personal pleas. This will be a completely random selection. If you include more than your name and the name of your guest, you will be instantly disqualified. People sending more than one email will also be disqualified. One entry per person please. 3) Check back here at 10 AM Pacific on September 30th, which is when I will announce the winner. The deadline for submissions is September 29th, 2013 at 10 PM Pacific. One important caveat: travel and accommodations are not included, so please do not enter the contest if you cannot get yourself to Los Angeles on November 18th. For all of you who can't make the premiere, you should know that tickets for the November 22nd opening day of THE HUNGER GAMES: CATCHING FIRE go on sale October 1st. 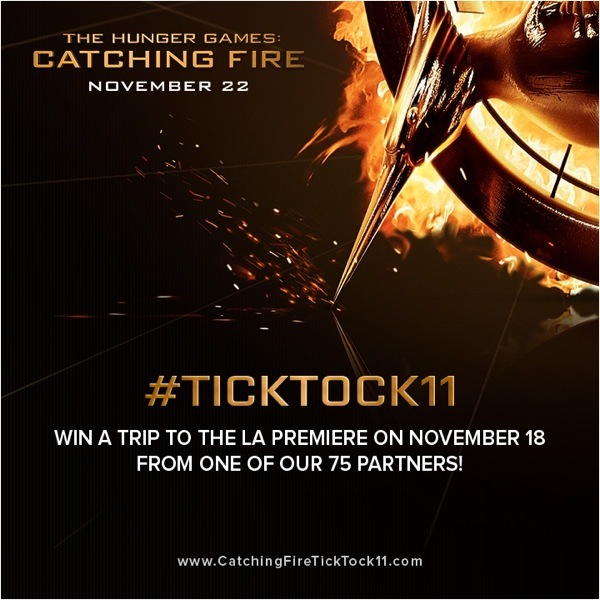 For more on the #TickTock11 contest, check out the official facebook page: www.CatchingFireTickTock11.com. For other TickTock "moments", be sure to check out http://www.thehungergamesexplorer.com/us/. Remember, the submission deadline is September 29th, 2013. May the odds be ever in your favor.